Prestige Custom Trim, Inc. is located in historic Lititz, Pennsylvania, in the heart of Lancaster County. We proudly serve Lancaster PA, Lebanon PA and Chester counties while much of our work can also be seen in the main-line suburban Philadelphia area. 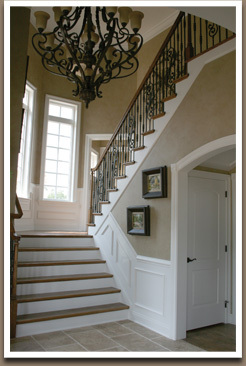 Chad Brady started Prestige Custom Trim, Inc. over 5 years ago with the desire to build a reputation by providing our customers with the best sevice, quality craftmanship, and attention to detail that exceeds the expectations of the most discerning clientel. With this desire in mind we are able to help builders, architects/designers and homeowners achieve their dreams and ideas. Whether it be a new custom kitchen, a new home needing interior trim and millwork, a staircase, or even one room with crown molding or wainscot, let us help you bring your dream to life. I have used Prestige Custom Trim for nearly all my home building and additions. True craftsmen, attention to detail, and they get the job done right the first time.